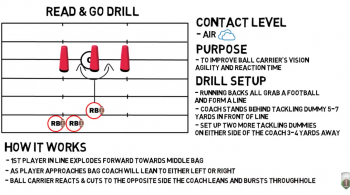 This tackling drill focuses on getting into the proper tackling position and the mechanics of a tackle from an angle. 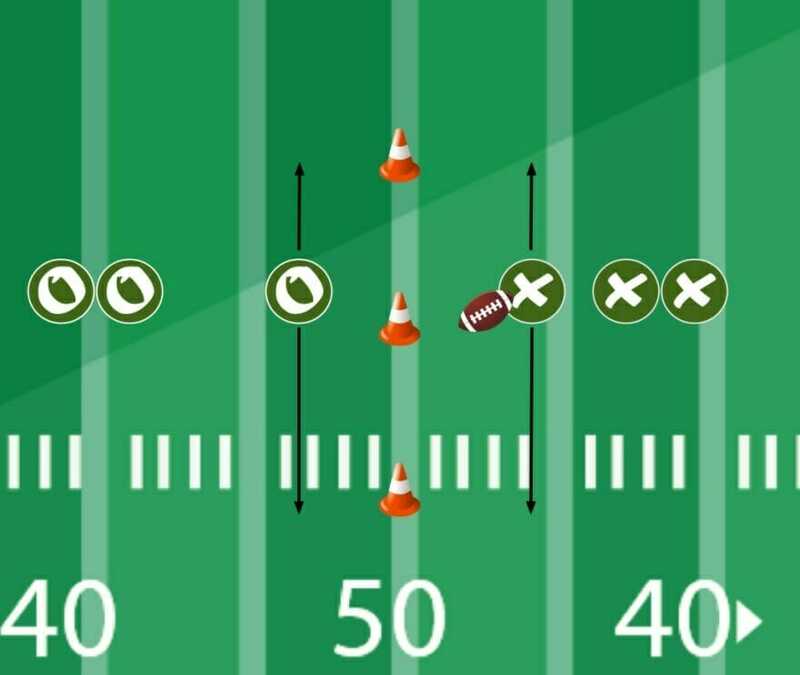 The cones should be set up two yards by two yards. The inside cones are two yards apart, which makes the cones that the players are at, facing each other, four yards apart. You have an offensive player and a defensive player, and the players are going to step toward a cone, in the same direction. The defensive player takes a step and freezes. That’s a very important coaching point–that both of them take the big step and freeze. That’s why the cones are so close. Coach up the stance: holster the hands, get your elbows close to you, then shoot up, grab some cloth, and shoot through. The eyes are at the numbers, actually a little bit lower. A variation of this drill is having the players take a couple of steps. Most running backs aren’t going to run to the defender. They’re going to run away from. This is part of the pursuit aspect of it. If you’re head up on a running back, he’s got two directions he can go. If you take away the inside, he only has one way to go, which is the outside. Push him to the boundary while everyone is pursuing.